NEW YORK, Jul. 13 /CSRwire/ - The United Nations Global Compact — together with its partners ICC and UN DESA — will next week (on 17 July) host more than 600 representatives from the private sector, civil society, Governments and the UN at the third annual SDG Business Forum. 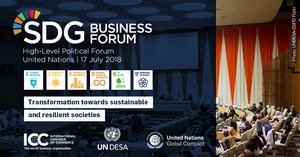 Held as part of the UN High-level Political Forum (HLPF) on Sustainable Development, the SDG Business Forum provides a unique platform for business to interact with key stakeholders, share their perspectives and showcase their efforts in support of the 2030 Agenda. Then, on 18 July, high-level representatives from the private sector, Governments, investor groups, financial institutions and UN Agencies will gather for SDG Country Plans: A Roadmap to Private Investment to highlight multi-stakeholder planning and implementation of the SDGs at the national level. The meeting will also focus on generating interest among the private sector and capital markets to invest in the SDGs alongside Governments and see the value that sustainable businesses, markets and societies can offer investors. In a new report to be published on 18 July entitled In Focus: Addressing Investor Needs in Reporting on the SDGs, the UN Global Compact, together with GRI and PRI, provide guidance to businesses to better align their SDG-related disclosures with investors’ information needs. The report is intended to support businesses in their efforts to reach investors and help mobilize the sustainable finance needed for the achievement of the SDGs. This publication complements the upcoming Integrating the SDGs into Corporate Reporting: A Practical Guide, to be released later this year. “Bold leadership from business is critical to the realization of the SDGs and we can show there is a strong business case for investing in opportunities aligned with the SDGs, including helping business secure stable returns, better representing the values of their clients and offering sustainable financial products that differentiate them in the marketplace,” said Lise Kingo. Next week, the UN Global Compact will also publish Global Compact Local Networks: Accelerating National SDG Implementation, which shows how Global Compact Local Networks around the world are engaging businesses, investors, Governments and the UN in driving the 2030 Agenda through examples from over 30 countries. Both reports will be published on the UN Global Compact website here.